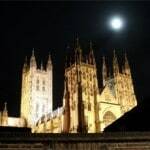 If you are looking for an extra special experience gift for a friend with an interest in the paranormal, or you're just looking for a fun and unique way to spend the evening with a loved one, then you can't get much better than this superb Canterbury Ghost Tour for two people! As one of Britain's oldest and most important cities, Canterbury has a rich and varied history... and if you're looking for some sinister tales that you won't forget in a hurry, then you certainly won't be disappointed with this great tour! 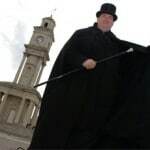 This fun and incredibly spooky experience is your chance to uncover Canterbury's dark side with a hugely enjoyable ghost tour, which is the perfect combination of history, humour and, of course, haunting. Led by an extremely knowledgable guide who is also an award-winning ghost hunter, you will learn all about the mysterious tragedy involving a mother and her children in the now-famous Tiny Tim's Tea Rooms, discover what not to do with a Ouija Board and what happened to those who took it too lightly, hear about what is regularly encountered late at night by the security guards in Canterbury Cathedral, learn how witches were dealt with in the 12th Century, and see a recreation of the death of the Archbishop of Canterbury, Thomas Becket. Whether you're a believer in ghosts or a firm sceptic, you're sure to feel a shiver down your spine in some of these scary locations... and you might just see more than what you bargained for...! So whether you want to enjoy this brilliant ghost tour yourself or would rather treat a lucky friend, why not put your nerves to the test and see if you've got what it takes to uncover and embrace Canterbury's dark side? A sensational and spooky experience! 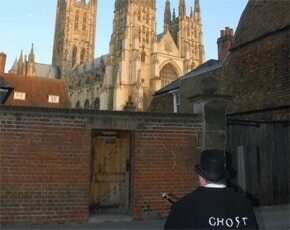 The Canterbury Ghost Tour is available on Fridays and Saturdays throughout the year at 8pm. Please arrive 15 minutes before. The Canterbury Ghost Tour is suitable for all, although all people under 18 must be accompanied by an adult. There is full disabled access. The Canterbury Ghost Tour will last for about 90 minutes. Please call if you are running late. 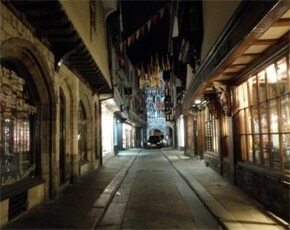 Participants: The Canterbury Ghost Tour for Two People is for 2 participants. The Canterbury Ghost Tour is for two people as part of a larger group. You should dress for the weather for the Canterbury Ghost Tour. Due to the walking nature of the tour, flat shoes are advised. The Canterbury Ghost Tour is not weather dependent, so please dress for the weather and bring an umbrella if needed! A very interesting evening, very informative, a bit gruesome in some descriptions. We saw a lot of things that we have never noticed before. Are you afraid of the dark? Us too! That doesn’t stop us wanting to go on one of these spooky ghost tours in Canterbury. I caught up with John from Canterbury Ghost Tours about their fantastically scary tours, their great customer service and their fascinating history. 1) Please explain your journey as ‘Canterbury Ghost Tour’ so far. My journey started when I was 13 at school in Goudhurst, I was at a private school which I hated and ran away more often than I stayed. On the last night I intended to run away with my best friend but on the night he missed the meeting and I went back to bed. He came to my bedside and said we had to go, I argued and he left on his own, the next morning I was informed by my housemaster that he had been killed some 10 miles from our school at the precisely the time he and I had argued. I had seen a ghost. From then on I was convinced that I could see spirits. I have been operating in the city of Canterbury every Friday & Saturday night since 1995 and have never missed a tour in all that time. The best parts of working for myself, is if it’s a lovely sunny day I can get out and enjoy it, and at night I can do my day job. Every customer is a new friend to make. I love talking to people about their own ghostly experiences and it always pleases me to read a glowing review of my tour, it means I may have changed an attitude on the way. My tour is based entirely on my own research and from garnering information directly from residents of the city that have experienced the paranormal in their own home. So it’s all first had experiences. I always try to interact with my customers learning a little about where they are from and relating to their own area, I have travelled extensively in England and the world and picked up many strange tales along the way. My tour is on all year, all weathers. Many of my competitors are only offering their tours during the summer or just around Halloween. I have regularly experienced the cold hand of the paranormal on my tours; many visitors have also felt the feelings of dread and misfortune, only last week an audience member fainted as I described the demise of one resident, and how the spiritual activity still affects current residents. 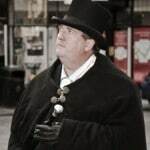 I have been running the tours since 1995 and have never missed a tour – making me one of the most reliable and longest running ghost tours in the UK, I have also published a book ‘Haunted Canterbury’ and appeared on National Television on several occasions to promote the city and my tour. In 2001 I started to work with partners in the city to allow meals to be included for a supplementary fee, these have proved so popular with groups that I can now offer them with a discount to couples and smaller groups. The tour and Meal Package allows customers to make a whole evening of it, after the tour relaxing in the knowledge that it’s all sorted in advance from pre-orders drinks and even a taxi booked for their return journey to the hotel. I have expanded and contracted the tours over the years, I still offer (for group bookings) tours of Whitstable, Faversham, and Broadstairs. I am regularly asked “if it’s raining is it still on?” Yes is the resounding answer – the show must go on.